Doing something different today, guys! Today we are talking food products, grocery shopping, healthier eating, and Target. I love where this is going already. This is a total nerd superfan (not sponsored or affiliated) post. In my little story in the text below where I talk a lil bit about going sugar free and how to grocery shop for that lifestyle, we have affiliate links to the program we participated in. While I bought all of these groceries at my SuperTarget (which just happens to literally be the first Target store of all time – I feel extra Target-Cool), keep in mind that the products that you find from store to store will probably vary depending on your location. So I know it might sound a little weird, but friends, I adore grocery shopping at Target. And let me specify that to SuperTarget. I grew up in a small Minnesota town that got a regular Target when I was, like, twelve, and it was the best day of my life. Eventually, I moved into the BIG CITY (ahem, suburb of Minneapolis) and I had at least 900 Targets within driving distance of my home. But even more importantly, I discovered this magic place called SuperTarget where you can buy everything you’d ever need in your whole life because it’s a regular Target with a Target grocery store inside of it. And usually a Starbucks. ♡♡♡ I am such a cliche right now. After several years of grocery shopping at various stores throughout the Twin Cities, I’ve realized that, against all odds (or maybe after succumbing to the power that only Target can have? ), SuperTarget is currently my go-to for groceries. In addition to having a soothing aesthetic and a huge selection of awesome products that are NEW and health-conscious and beautifully packaged because these are the things that make me smile, it’s often the place where I can get the best prices. Cartwheel app? REDcard? Yeah. You get it. The thing about grocery shopping while trying to eat better is that IT IS HARD. I recently finished a 60-day refined sugar free challenge that a) was really awesome and feel-good, and b) made grocery shopping extremely challenging. We all know it, but the reality of practical grocery shopping when trying to eat better is rough — there is refined sugar in almost EVERYTHING on the shelves of the grocery store. But there is still light! 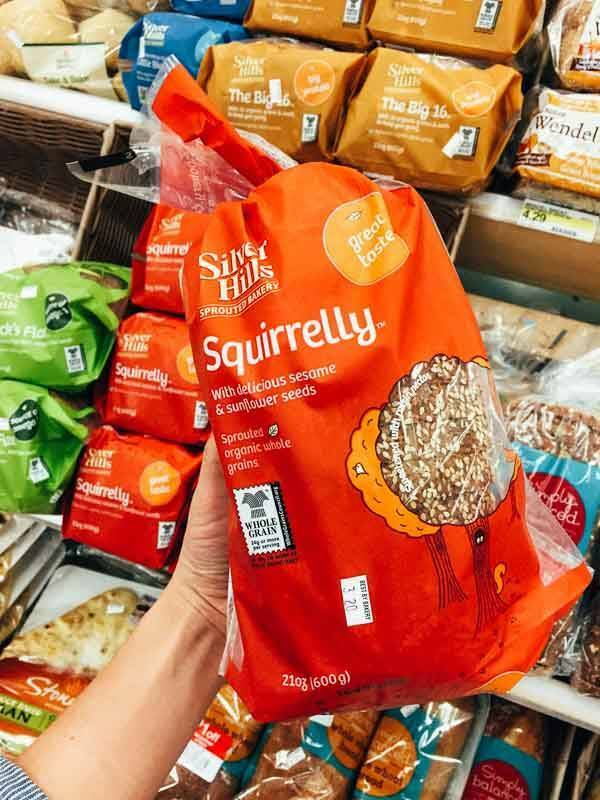 Over the last few months, I have found 24 healthy groceries at SuperTarget that fit with my 60-day refined sugar free challenge and that were totally delicious and awesome. To see the groceries I love, scroll on! And to see the refined sugar free program we participated in, check out Go Sugar Free. Jacqueline is a great mentor and there is a spring session starting soon. Check it out or read about how Bjork and I took on the sugar free challenge and made it work for us in this post. Why I like it: If you’ve ever looked at the labels on peanut butters and beyond, you know how many nut butters in the world have added sugar. 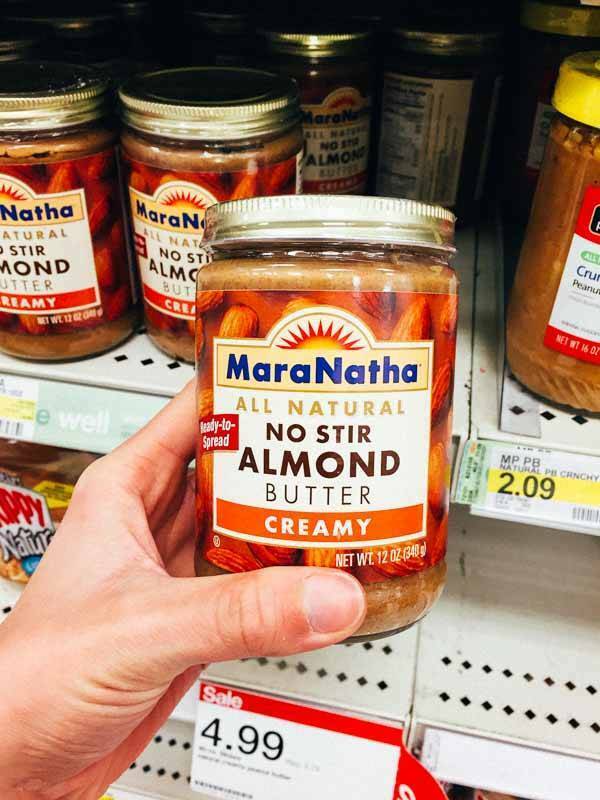 Enter MaraNatha and a handful of other brands which you can buy at SuperTarget – I’ve been buying MaraNatha for almost a year now because their both their Raw and Natural varieties of almond butter have no added sugar. 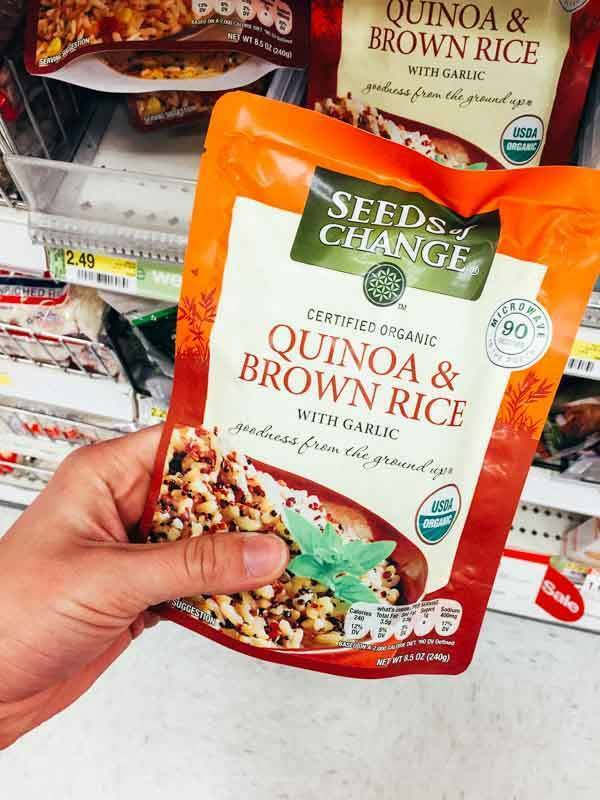 Why I like it: My regular SuperTarget has many varieties of quinoa, but this one is usually the most affordable and the most “regular” – no pre-added flavors or quinoa-blend type things in the mix. Just straight up, uncooked, unflavored quinoa. Why I like it: Okay, now that I’ve sung the praises of the plain, uncooked quinoa, let’s move to the quickie quinoa and brown rice packet that is pre-cooked and garlic-loaded and secretly awesome. Seeds of Change: making weeknight home cooking realistic. Thumbs up for that! Why I like it: Lots of pre-made sauces are loaded with sugar and other unmentionables — which is why red curry paste is always always ALWAYS on my list of pantry staples. When you make your own curry halfway from scratch using a paste like this, you can control what actually ends up in your curry sauce (think ginger, garlic, and coconut milk). How I use it: Red Curry Lentils AND the best ever Red Thai Curry Sauce. Get on it. Why I like it: Anyone else seen this around lately? Seems like I’m seeing it everywhere, which is awesome because it’s REALLY yummy with chips, veggies, enchiladas and tacos, just… everything. In the last year or so, I’ve just gone ahead and permanently added salsa to my grocery list because, I mean, SALSA. And out of all the brands I’ve sampled over the years, this one is the current winner. Why I like it: With the whole less-sugar-and-fewer-refined-grains thing, I’m trying to eat brown rice when I can, but the one rice that always gets me is Basmati rice. How do you even eat Indian food without that steaming pile of white Basmati rice? You don’t. Unlesssss you have THIS brown rice version of Basmati that they sell at my beloved SuperTarget which is delicious without sacrificing any of that perfectly fragrant Basmati essence. Annnnd I just said essence. Why I like it: Okay, truth be told, my very first preference for whole wheat pasta would be DeLallo brand. But I’m still waiting for SuperTarget to stock DeLallo products (are you listening, Target?) so when I’m making a Target grocery run, I always pick up some of their Simply Balanced brand whole wheat pasta. How I use it: Garlic Butter Spaghetti with Herbs and I feel happy about life. Why I like it: How to even express the love for these tomatoes? For some reason, I can’t find them at all grocery stores, but they are always at my ST. 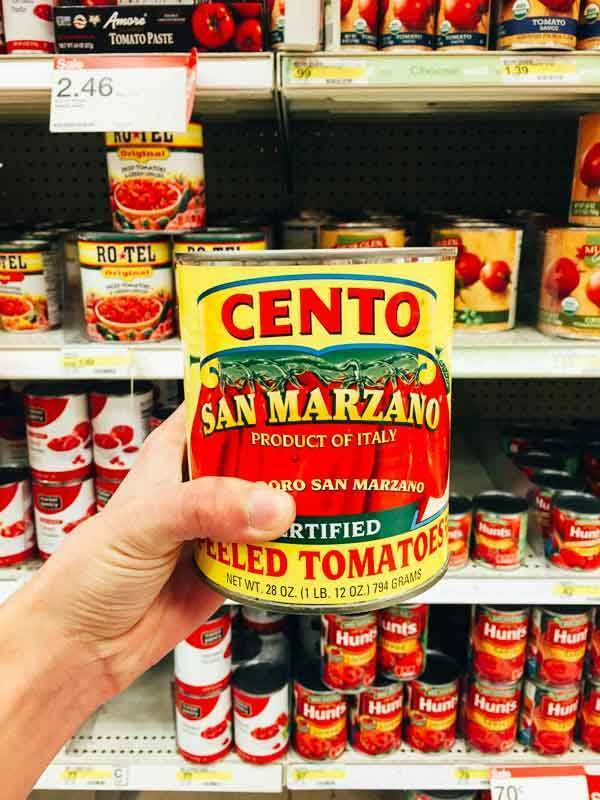 They work beautifully in just about any recipe that calls for canned tomatoes and their taste is the riches, juiciest, and most delicious of all the canned tomatoes. 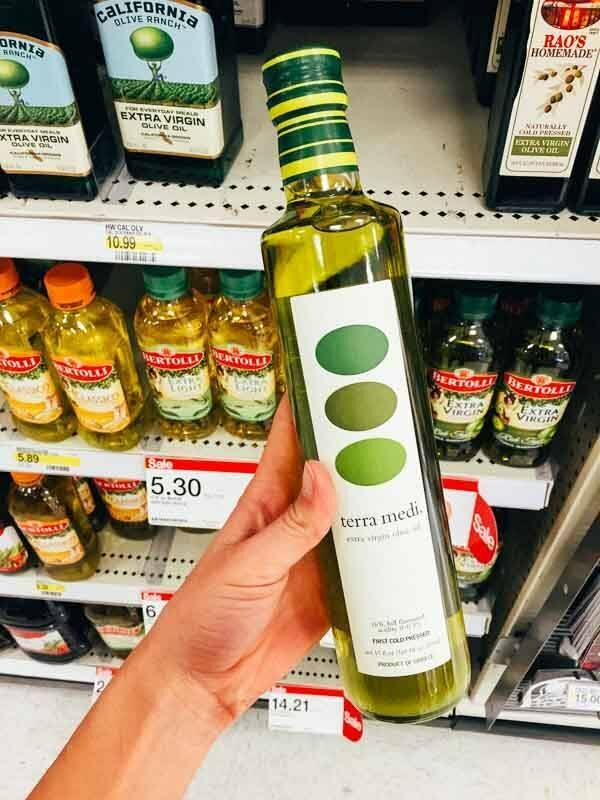 Why I like it: I’m not necessarily super picky when it comes to olive oil (I’m still developing my ultra food snob palate, okay?) but this is the brand of olive oil I’ve been buying lately. I use it in all my homemade dressings because IT JUST TASTES BEAUTIFUL. Like, really beautiful. Drizzled over everything. You’re welcome. Why I like it: With that whole fewer refined grains thing going on, I thought I’d see how this health nut bread performed as morning toast. And I’m happy to report it was my almond butter and banana’s perfect pair. This bread is two thumbs up, both in taste and in ingredients. How I use it: Poached Egg and Avocado Toast magic. Why I like it: No, for real, though – how much do I love this stuff?! It’s so seriously delicious AND it’s made by a Minnesota company! Represent. I’ve been eating the Ginger Pear Macadamia Nut muesli soaked in hot water and topped with sea salt, a spoonful of flax meal, and a tiny bit of maple syrup as my breakfast for a few months straight now and I’m still not sick of it. No refined sugar and full of wholesome things. It’s a happy breakfast! Why I like it: So I’ve been serving this as our post-dinner treat at my Dinner Club with all my friends, which is a little random, but you guys – it’s always a hit. It’s like people forget about how awesome peppermint tea is until they have it again and then – BOOM. 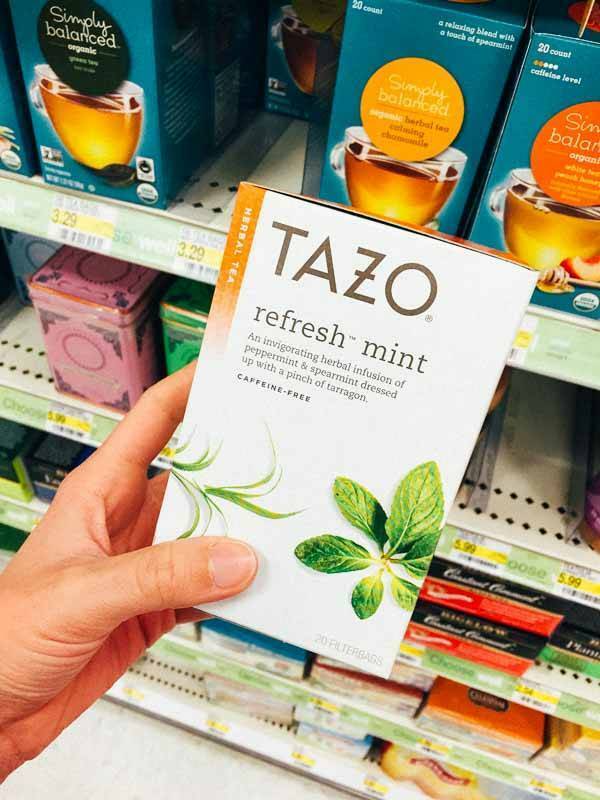 We all sit around sipping our peppermint tea in a state of lovely zen. It’s the perfect cozy, calming, good-for-you, end-of-day treat. 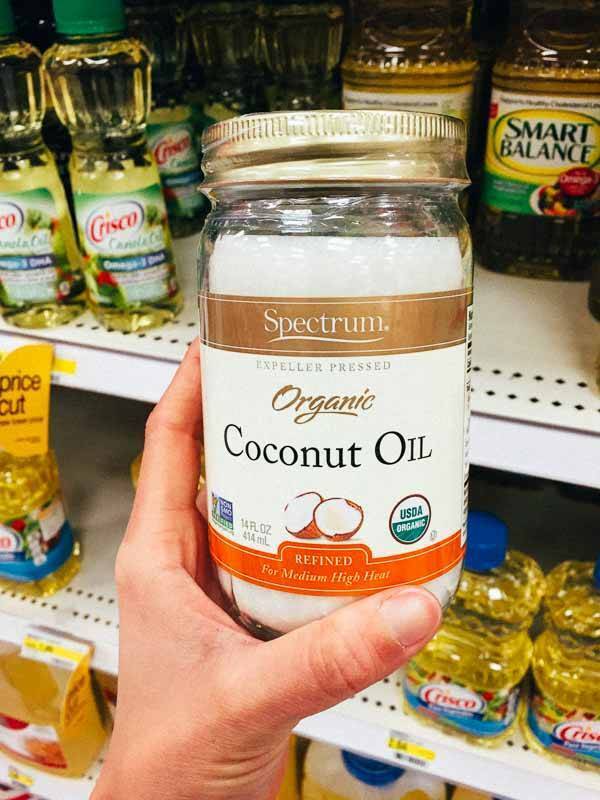 Why I like it: I’ve been buying and trying lots of brands and types of coconut oil over the last six months and still haven’t settled on one particular brand, so this isn’t necessarily the one I would recommend as the ultimate, but I just wanted to point out that you can buy coconut oil at Super Target. How I use it: Favorite Coconut Oil Granola is in your future. Why I like it: To add to smoothies, oatmeal, baked goods, sauces, and everything in between. I keep a bag of this in the fridge at all times and put a scoop in our green smoothies every morning because I really like the texture and also: all the nutrients. How I use it: Oatmeal Flax Blueberry Muffins, anyone? Why I like it: I first got turned on to Kind bars when we did our 60-day sugar free experiment. Technically they have some sweeteners in them (think honey or maple syrup) – and since we started buying them, I’ve seen more varieties crop up that don’t necessarily hold to the original Kind 5 grams of sugar or less rule, but nevertheless, these have significantly less sugar and more good things going on than your average granola bar. These are a MUST in our house. My favorite is the Maple Glazed Pecan and Sea Salt. 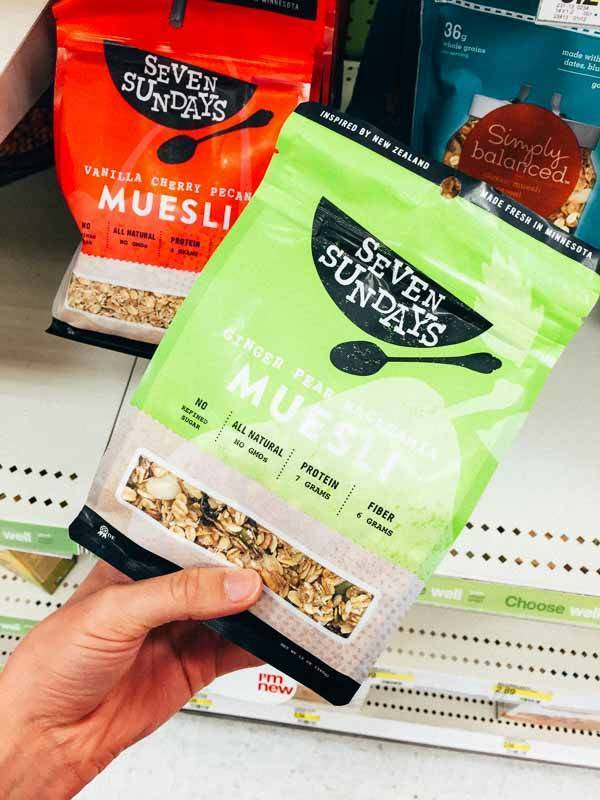 If and when you want to find these in your SuperTarget — I don’t know why, but these are only stocked in the health foods section near the weight loss shakes and all of that, so don’t get sad if you don’t see them in your granola bar aisle. They are probably there, just hiding in amongst the health foods. Why I like it: Made with dates, nuts, and sea salt. So, so, so, so, so good for an on-the-go real food treat. For me, it’s usually second breakfast or dessert. I’m going to get bossy for a second here, but both Bjork and I agree that the Peanut Butter Cookie is by far the best – don’t even mess around with the other flavors. Same health aisle location tip applies to these! 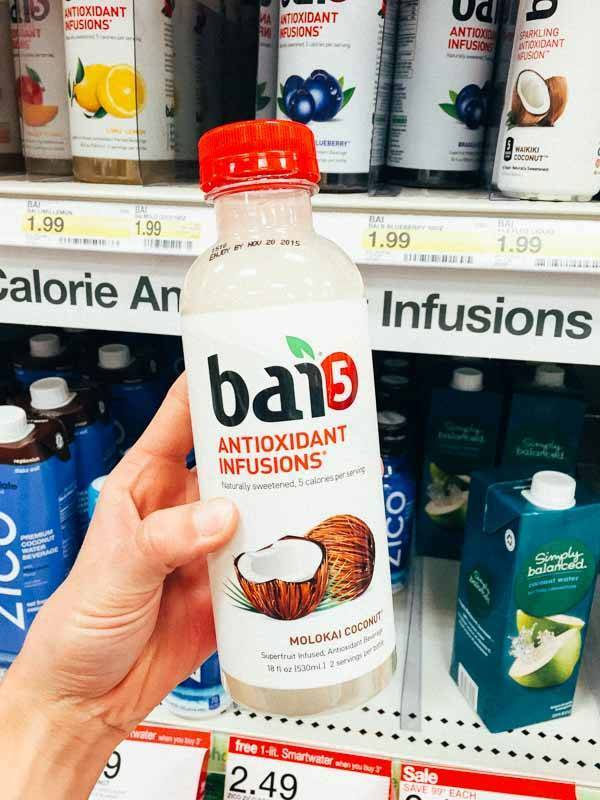 Why I like it: You already know how much I am loving this new line of drinks, right? What makes me love it even more is that they now sell this at my SuperTarget. I mean, come on. As if that isn’t the best news everrrr. I like the Molokai Coconut the best and it makes for the perfect addition to a green smoothie. How I use it: Simple green smoothie. Also – I stocked up on the lemon lime a few weeks ago when I was sick and I was looking for a liquid diet that involved good things (antioxidants! hi) instead of refined sugar. Perfect! Why I like it: I’ve been having a moment with pistachios lately. They are really, really good and I think I sort of just forgot about them for a few years. 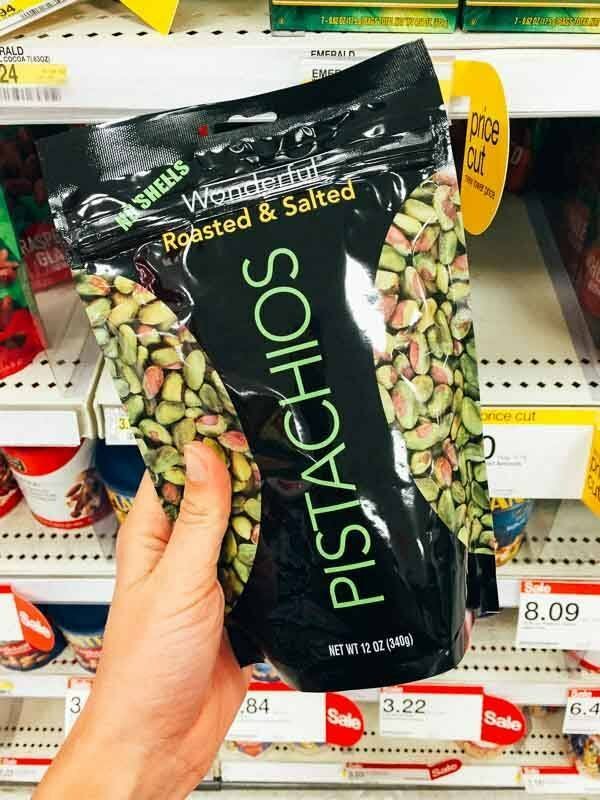 I wanted to mention them because unlike most of the other grocery stores I frequent, SuperTarget sells these big bags of pistachios that are shelled. Meaning you can use them in recipes or for snacks without needing to break all those shells off first. Thank you, SuperTaret, for making the good things in life (pistachios!) more simple! Why I like it: On the one hand, this is totally ridiculous. Why would you buy pre-popped popcorn when you can make it in your own microwave? Mostly because it’s really good and it makes for the best lil’ Friday night snack when sipping on Grapefruit Mojitos and watching The Vow with your sisters and mom. Just saying. Why I like it: This yogurt! This yogurt. This yogurt is so super good. It’s creamy and rich but much smoother and a lot less gloppy than most of our other usual yogurts. The flavors are delicious and unique. My favorites are the Honey Pear and the Blueberry Cardamom. Grass-Fed Cream Top Yogurt at SuperTarget?! What is this world coming to. 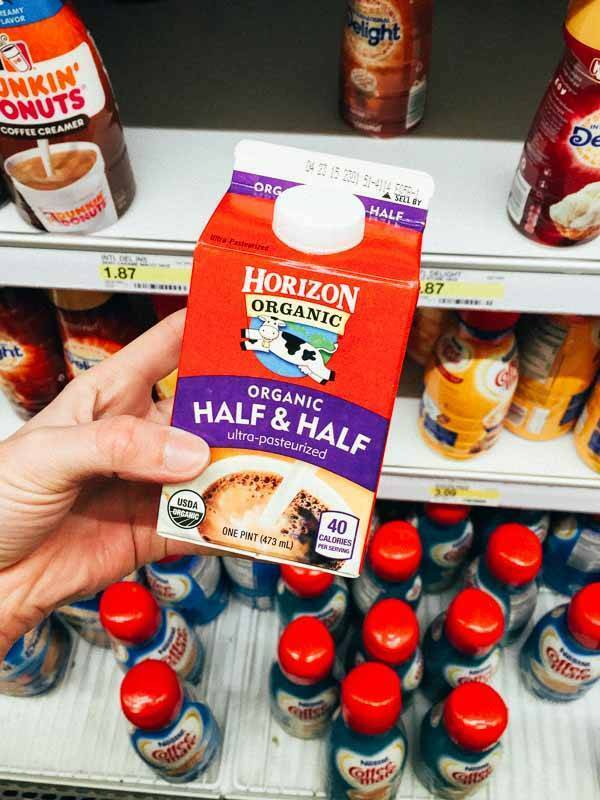 Why I like it: As a more whole, refined sugar free swap for flavored coffee creamer, which I have been known to drink straight from the bottle, we’ve been buying organic full fat dairy for coffee in the morning. It’s the perfect match for my super strong Starbucks Espresso blend and it’s also really good in recipes. So long, Candy Bar Coffee Creamer in a bottle! I can and do love my coffee without you. Why I like it: We don’t do a lot of frozen meals, but we do a lot of Amy’s. So maybe we do do a lot of frozen meals. Amy’s is a lifesaver. As a food blogger, you’d think that I would love cooking all the time 24/7 forever, but that would be wrong. Sometimes all I want to do is pop something in the oven or microwave that will give me a yummy real food meal super fast without any work on my end. This is that! And this variety – the Mexican casserole bowl – is THE BEST. Perfect with chips and salsa (see #5). Why I like it: Confession: I’ve been a frozen fruit hog lately, which miiight be why all the Simply Balanced organic frozen fruit shelves at my SuperTarget are empty? I dunno anything about that tho. We use frozen fruit for green smoothies every morning – my favorites are peaches and mangoes, and Bjork’s all about the berries. And I just love that the in-store brand at SuperTarget (Simply Balanced, formerly known as Archer Farms) packages ORGANIC frozen fruit. Thank you thank you thank you! How I use it: Simple Coconut Green Smoothie – I’m telling you, it’s a must for healthier, fruit-and-veggie-loaded mornings. So that’s it! 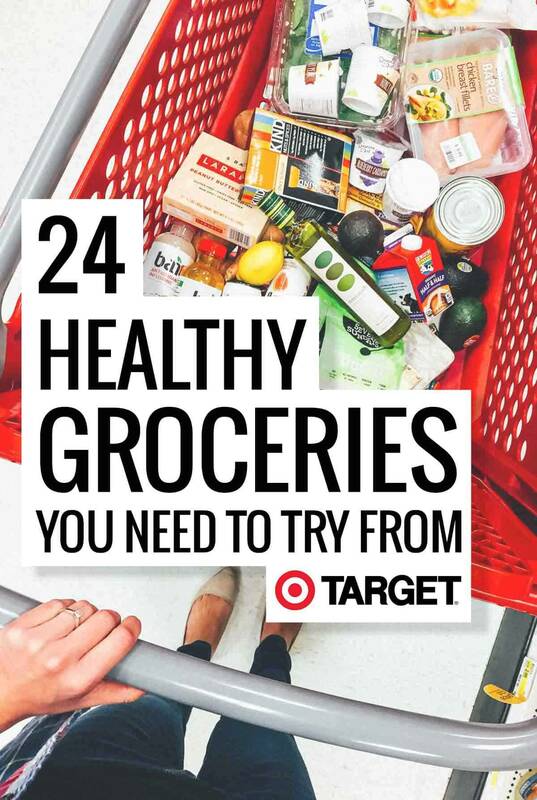 Those are the 24 healthy groceries that I buy at SuperTarget and that I really think you will love. If you’re looking for more interesting and helpful information about grocery shopping at some of the hot spots, check out these fun posts from my sweet food blogging friends around the blogosphere. In a perfect turn of events, I’m literally off to Target this morning to refill on groceries after traveling for ten days. AND I CAN’T WAIT. I would love to hear from you all around the US and beyond – where do you grocery shop? any tips? I didn’t even know there was such a thing as a SuperWalmart! Wowee that’s impressive. The only food you can get at Target in Australia is chips, lollies, chocolate and soft drink! Not exactly on the healthy list. Dang! Come on, Aussie Target! WHY CAN’T I HAVE TARGET 🙁 middle of nowhere probz. Um, Super Target?!?! Why have I never heard of this? But really though, I have used a few of these products and LOVE all of them! I just got accepted to be a Larabar ambassador and got a huge package – best day eva. 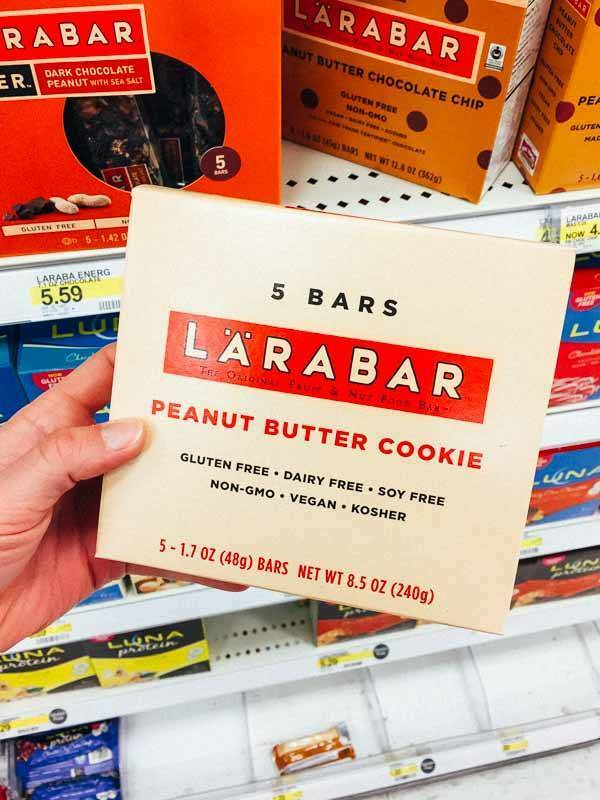 LaraBar is the best! That’s so great! And YES! I meant to say that, but yes. I did get weird stares. THIS IS MY JOB, PEOPLE. We don’t have a Super Target, but we do have a Target with some groceries, and it’s about the best thing ever! I love being able to go there & just grab a few things (and then a ton of random other stuff from the rest of Target!) It’s my boys’ favorite place too (my 3 y-o begs to go to Target, goof). I know I’ve seen some of these things in ours, I’ll have to check them out! That’s awesome- even in a regular Target!? Hope you like them as much as I do! Wait, I didn’t even know they had peanut butter and jelly! Too good! I love Target, and this post has officially made you the best person evvvvah. Cyber hug. We don’t have a ST near us but the normal Targets have their fair share of groceries now too. This was such a fun post. I really enjoy grocery shopping and now I want to hop in a car and look for some of these items to try out. 1. Love Seeds of Change Rice…I buy the seven whole grain version and put some on top of my salad for lunch. Love the whole hot over cold thing. 2. It’s not cheap, and I usually make pancakes from scratch, but I do love to have a box of whole grain Kodiak Cakes Flapjack and Waffle mix in my pantry for an easy breakfast (just add water) Target usually carries two or three kinds. I usually buy the one with buttermilk in it. They have a new one with extra protein in it. They make thin, hearty pancakes, and I think there’s 3 grams of sugar or less in them. Love ’em. Love that they are whole grain and love that they have between 7 and 14 grams of protein, depending on which one you get. 3. Didn’t know about the yogurt. Definitely need to check that one out. 5. Favorite pasta is Barilla Plus, in the yellow box. Lots of fiber and protein and the texture is perfect for us! I prefer it over whole wheat. I get it at our local supermarket, but I think Target carries it too! I could go on and on…I’m the crazy person that has to go to 4 stores to do my weekly shopping…loved this post! Hahaha – I get it. I sometimes end up going to multiple stores but I always try not to if I can hold myself back… all that time! eek. I love Super Target! These are some great ideas–I also love buying San Marzano tomatoes and that yogurt looks so tasty. I need to get my hands on that. Great post! I absolutely love shopping at my Super Target, I can spend hours cruising the aisles. Go in with a short list and end up with a shopping cart full. Love, love, love TargetLand! Great post! Even though I hardly buy food at Target but it’s good to know what’s healthy. 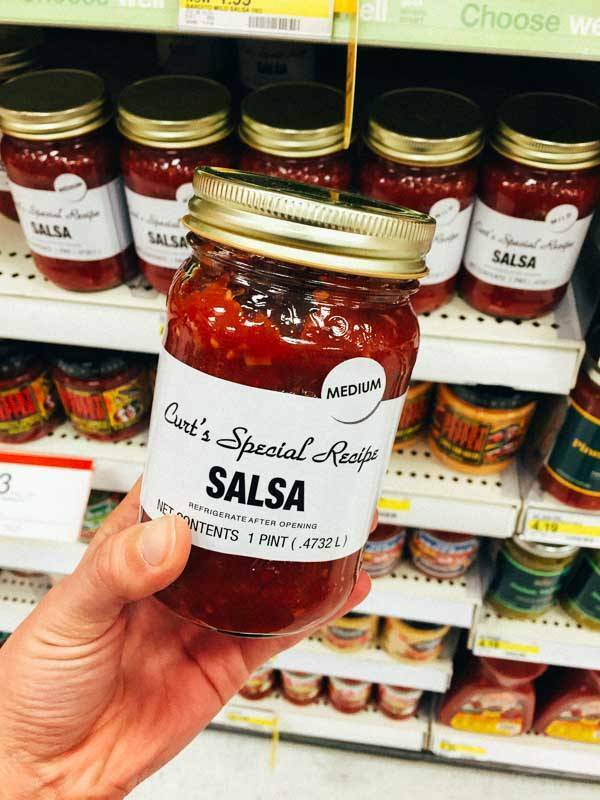 Check out Trader Joe’s – I did a similar post about my favorites from TJ. TJ is super affordable and carries smaller brands with cleaner ingredients compared to bigger grocery stores. I was literally just talking to my husband about doing all of my shopping at Target!!!!! Now I have to try it, great article! Hi hi! Mmmm yes to the Boom Chicka Pop (although my favorite is the sweet and salty version in the teal bag) and also the maple pecan kind bars are TO DIE FOR. It is weird that they are always in the weight loss/protein bar section though. They also have incredible pasta sauces. I luvs me some Target. Thanks for the link love too! I actually unsubscribed from your emails because of this post. Pushing packaged and processed food is a bad idea. Sounds like unsubscribing was the right move, Jay. Take care. Well if this isn’t the most helpful grocery store blog post I have seen in a country mile! Thanks for this! This is such a great post. Creative, fun, and very informative! Thank you! We live in the boonies so shopping pretty much stinks. I’ve never seen a ST and the closest Target is at least a half hour away and I just don’t have the time to go there since it doesn’t have many groceries. Oh, and don’t EVER eat microwave popcorn…..REALLY bad for you. Love this list. Is there a printable version I could take shopping? That’s a great idea Susan! We don’t have a printable version right now – sorry! Bookmarked. Such a great post, thank you!